The trails at Turkey Mountain Urban Wilderness Area in Tulsa offer technically challenging elements for mountain bikers with several steep climbs and descents. Mountain bikers know something road cyclists don’t: Riding a trail is more exciting than road cycling – and with no automobile traffic to contend with, it’s just you and your bike, and the natural world around you. Of course, the trails are a big part of the fun of mountain biking, as each has its own personality with its own unique obstacles and challenges. These trails, and the fact that most are located in scenic, wooded areas, are great reasons to love mountain biking. The Turkey Mountain Urban Wilderness Area in Tulsa consists of 300 acres of hilly, undeveloped woodlands just south of I-44 and west of the Arkansas River. The multi-use trails here are primitive and very technical in nature, and they feature lots of rocks, twists and some steep climbs and descents. The Lower Trail is only a mile in length, while the Pond Trail is two miles and the Ridge Trail runs five miles. All are well-marked with color-coded signage. There are no facilities at Turkey Mountain, so you’ll want to bring your own water and gear, and a first-aid kit. And don’t forget to wear a helmet. The Arcadia Lake trails are located just east of Edmond and are convenient to the Oklahoma City metro area. The main trail is designated for multiple uses, including biking, hiking, running, birding and horseback riding, and runs approximately 6.5 miles from the park office located at 9000 E. 2nd Street to Spring Creek Park located at 7200 SE 15th Street. This is a twisting, winding single-track trail with bridges and a creek crossing. Some parts of the trail can be impassable during periods of prolonged rainfall, while dry weather presents numerous sandy patches that can be challenging to negotiate. The main trail is designated by white markers while yellow markers indicate alternative paths. The trails are owned and managed by the City of Edmond, and a nominal fee is charged to enter. In addition to its well-known hiking trails, Osage Hills State Park features nearly 3.5 miles of dedicated mountain biking trails over challenging terrain. The park’s narrow, single-track trails incorporate switchbacks and lots of climbs and descents. “These rocky trails have lots of rise and lots of fall,” says park ranger Michael Vaught. “There are some technical areas to challenge riders, but they’re not off the charts.” In addition to the bike-specific area, mountain bikers also have access to the park’s hiking trails for a total of about seven miles of trails. Located just near Pawhuska off U.S. 60, Osage Hills State Park is a scenic park in a heavily forested setting. Along with mountain biking, the wildlife viewing is excellent here. 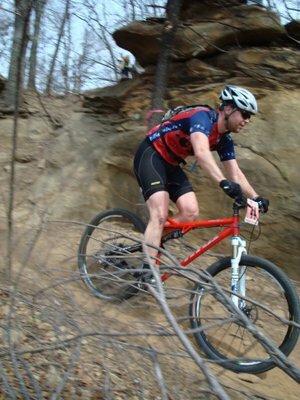 Situated in a remote area approximately 20 miles east of Atoka in southeast Oklahoma, the McGee Creek State Park and Natural Scenic Recreation Area offers more than 30 miles of mountain biking trails over hilly, rocky terrain. Set amid the area’s rolling, pine-covered terrain, McGee Creek’s single- and double-track trails are primitive, but marked with rocks in many places. All of the trailheads are well-marked. These are multi-use trails, open not only to mountain biking, but also horseback riding and hiking. However, because they lack facilities and are far from major metropolitan areas, these trails are seldom crowded. Because the McGee Creek trails are extensive and remote, it is important that visitors fill out the hiking permit card at the ranger station upon arriving in the park. This permit lets the park staff know you’re using the trails, and when you’ll return. Keep one half of this card and deposit the other half into the permit box. Once you return from the trails, deposit your half of the card into the box. This lets the park staff know you’ve returned safely. McGee Creek requires mountain bikers to wear helmets, so don’t forget yours. And don’t forget a patch kit and some basic tools, as you’ll need to be self-sufficient. Many mountain bikers consider the 11 miles of trails at Lake Thunderbird State Park, east of Norman, as among the best in the state. This series of interconnecting trails is found on the south side of Lake Thunderbird, between Clear Bay and the South Dam areas. The Clear Bay Recreation Area trailhead provides access to a couple of short, easy trails. There are also two medium-length trails ( 2 - 2.5 miles) and these are moderately difficult. The most technical trail runs 4 miles. Lake Thunderbird’s single-track trails incorporate some technical features, including steep climbs, drops and rock gardens. They’re well-marked with color-coded arrows and mile markers.